Its official debut is getting closer. This summer, perhaps? What you’re looking at could end up being the last naturally aspirated Porsche 718 Boxster ever. Or it may not be. Porsche hasn’t exactly made an official announcement. But what will be official is the production version of the 718 Boxster Spyder prototype you see here sometime this summer. Our spy photographers caught the roadster as it performed some final winter testing, and there’s actually fairly little camouflage covering it. When test engineers decided to make a pit stop, our photographers swooped in for an up and close look. A few things to take note of: first off, notice the exhaust pipes have grown and moved position when compared to the last Boxster Spyder. Why is this significant? Because it was done in order to accommodate the , where it . 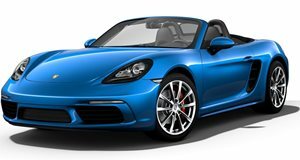 For the 718 Boxster Spyder and its coupe twin, the , power will likely be downgraded to around 430 hp. Another noteworthy addition is that rear diffuser, which is definitely not found in the base 718 Boxster. And, as with any Porsche Spyder variant, there’s the rear pair of humps, and a cloth cover that resembles a tent. Remember, the goal here is to cut weight wherever possible and add power. A few snaps were also taken of the interior, which shows a six-speed manual. We already knew this gearbox would be happening, but what we don’t know just yet is whether the PDK will be an option. Porsche could very well keep the 718 Boxster Spyder and manual only. We’re expecting to see the Porsche 718 Boxster Spyder debut this summer and it’ll also surely be at Paris next fall. Why a summertime debut? Because also at Paris the next generation 911, the 992, will make its debut. Remember, the 911 will always take precedence over the Boxster and Cayman.